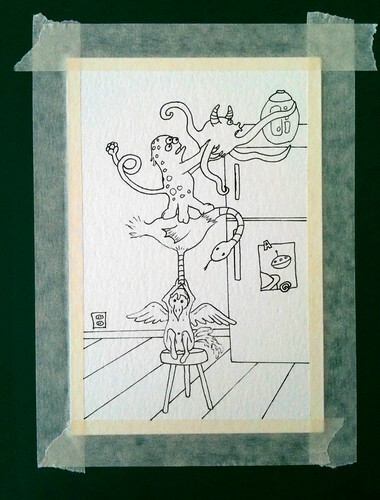 Sitting on my desk is a cute monster gocco print and a business-card version of another monster print, both by Carrie Wagner. They inspired me to draw some monsters of my own. 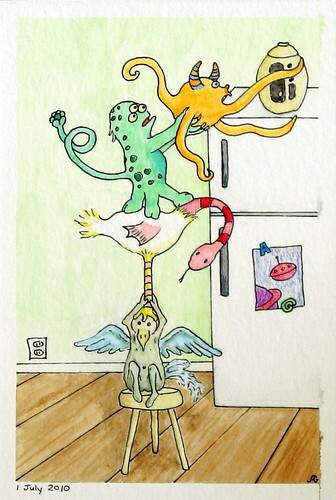 Originally I was envisioning a sort of monster totem-pole, but part way through, I recalled this cute painting, which I saw when reading some artsy blogs recently. It suddenly seemed just right that the reason for this tower of creatures was cookies! My family will recognize the cookie jar. My Mom had supersonic hearing when it came to detecting the slightest scrape of that lid. Accordingly, my older sister taught me the way of removing it silently. To this day, I suspect we are the only two people with the knack. I had a lot of fun dreaming up different monsters, so don't be surprised if more cute and creepy creatures show up soon. The careful observer will also note a reference to my purple-suited aliens. I really like the Snakefish Bird. The creator of the famous cookie jar (my brother), also knows how to ...quietly... remove that lid. My suspicion is that he showed a certain young lady (a.k.a elder sister) how to snag cookies ultra-silently.